Many years ago in Ontario, I was treated by a Naturopath-Chiropractor, a divorced, middle aged man, father of two. This quirky, opinionated man fell in love with a beautiful young woman and together they had a baby, to the amazement of everyone who knew him. One day Richard told me that he had found freedom through commitment to his new wife and babe, a concept foreign to me at the time. Yesterday morning I opened Sharon McErlane’s newsletter from The Great Council of Grandmothers, entitled What Service Will Do For You. “Service is freedom and service brings freedom,” the Grandmothers said. “Loving service is powerful. “Connecting with others in the light”, they go on to say, our limitations begin to melt and our energy shifts. (I will post this newsletter in its entirety on the blog later). Western volunteers we met in India echoed our sentiments, that we all get back much more than we give to the Tibetans we help in Dharamshala. The same goes for our work with displaced Tibetans and Syrian refugees here at home, and now my volunteer work with the newly founded Canadian Children’s Sanctuary Namibia Society. Recently we held our first AGM followed by a General Meeting and were privileged to have Helge, our Namibian Agent, and a member of both the Canadian and Namibian Boards, with us during our discussions. Though my energy was flagging near the end of an intense day, but Helge immediately riveted my attention when she began speaking about her experiences in Drimiopsis, the settlement where the orphaned and at risk San children subsist in neglect and poverty. I have observed abject poverty on my Indian travels, and have become inured to it to a degree, in order to continue visiting that country. However Helge managed to paint a visceral picture of the lives of the children and teachers in the Drimiopsis settlement, one that penetrated my privileged and safe white Canadian mentality. Listening to this gentle, spiritual white woman speak lovingly about her work with the children opened my heart and moved me deeply. Helge spoke about how she slowly, over a number of years, encouraged the teachers and other supporters of the San people, re-settled in Drimiopsis, Namibia in 1991, to begin rebuilding their community, starting with food and water security, education for children and employment opportunities for adults. She happily reported that they have now taken ownership of development efforts by starting the brick building project that to date has produced 12,000 bricks, working with a volunteer architect to design the first Sanctuary building and hiring a security guard to safeguard the supplies needed for both the building and the protective fencing for the site. I am proud to have the opportunity to offer my service and skills to this community as a member of our dedicated CSNS team. The first two Syrian refugee families have completed their first year on the Coast, sponsored by a Gibsons Church. They are doing well and are enjoying being part of this special, supportive community. They have paved the way for the next family, sponsored by the Sechelt Activity Centre, later this year. Being part of the Syrian folks lives has been an honour and a privilege, and we are happy to call them our friends, as we do the Tibetan family we sponsored several years ago. The first Tibetan families from remote northeast India, arrived on the Sunshine Coast in December of 2013 and were followed by several more families, for a total of close to 20 here in our community. The private sponsorship project ended at the end of 2016. All these folks have made a positive difference, enriching our community by their hard work, their deep spirituality and friendly manner. They are willing to help other new refugees, like they were helped. The 1st arrivals helped the next Tibetans. Now the Tibetans help the Syrians in any way needed, by attending fundraisers and loaning their vehicles. We get so much back from volunteering, whether in India or at home. As the research has shown, helping releases feel good brain chemicals: dopamine, endorphins and oxytocin. There’s more, but you can read the article through the link if you’re interested. I really can’t imagine what my life was like before we began volunteering! The idea of being part of an organized group bringing refugees to Canada on an ongoing basis has resonated with me for several years. From late 2013 into 2015 we were part of a group that sponsored a family of Tibetans into our community, as part of Canada’s Tibetan Resettlement project. The group of 1000 Tibetans who have arrived, or hope to come to Canada, if they have private sponsors, are from the remote tribal states of northeast India, specifically the state of Arunachal Pradesh. We were inspired to participate in this project because of our travels and volunteer work in India, in Dharamsala, the home of His Holiness the Dali Lama. 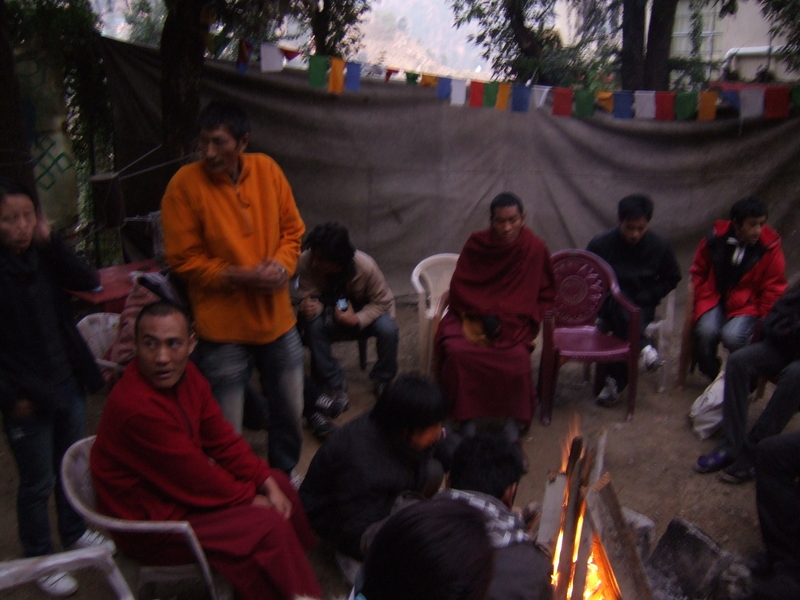 Each Tibetan we met there, through our work, at Men-Tsee-Khang Medical Clinic or on the street, impressed us with their sincerity, groundedness and spirituality. Our lives have been deeply enriched through both our experiences in India and here in our home community. We will always remain close to our Tibetan friends in both countries. Now it feels right to branch out, to step up and help with the needs of Syrian refugees. Many are waiting in Jordon, Lebanon, Iraq and Turkey to be sponsored, either by governments or private sponsors. Conditions are very difficult. Last winter there were windstorms and flooding in Jordan. Many shelters in camps were destroyed. Urban refugees suffered through bitterly cold nights, sometimes below freezing. We will be playing a small part in helping Syrian families, by being part of Christian Life Assembly’s church/community partnership that is bringing the first family to Gibsons, through a private sponsorship. Who are the 25,000 Syrians Coming to Canada? PLS NOTE: The picture at the top is of a refugee child holding a picture she drew of her former home. Credit abcnewsgo.com. After fifteen months of processing what was and what might have been in my life, something that felt necessary before moving into the next phase, things suddenly clicked into place one morning, when the words “There’s a lot to be done” came into my body in a visceral way, somehow intersecting my head and my heart. Although it’s not clear at this point, I can “see” in a fresh, deeper, knowing way, that my place in the world is significant, that clearing my own stale issues and helping others will contribute to the healing of the planet. When we all do what we can it has a cumulative effect. Awakening each morning and being a positive force in the world, emitting positive, healing energy – that in itself is enough to make a significant difference. For me there’s something about writing that moves me forward. Recommitting to expressing myself this way, after a couple of years of not writing, gives me impetus. Baby steps, like buying the chair I will use for my newly emerging energy work, and joining others in our community who in a mutual goal tohelp Syrian families are other pieces. Yes, there is a lot to be done in the world, and more and more of us are now contributing to what will become a critical mass of healing and growth for our planet and everyone living on it. Ellen Besso is a life coach, counsellor, author & energy worker. Her work combines her newly emerging High Heart Chakra work, EMDR, Reiki & Trager. Ellen’s books, “An Indian Sojourn” and “Surviving Eldercare”, can be purchased through Amazon or from Ellen. contact her through the blog comment section or email her at: ellenbesso@gmail.com.